The men’s lacrosse team improved its record to 6-2 on the season this past week, with easy victories over out-of-conference opponent SUNY Oneonta, in addition to a NESCAC win over Colby. With a 2-2 record in NESCAC play, the Cardinals currently sit tied with Little Three rival Williams for sixth place in the conference. Last Saturday, the team welcomed Oneonta to Middletown for an evening bout. Led by Harry Stanton ’18, the Red Birds coasted to a 16-6 victory. For the third time in five games, Stanton scored four goals, while tacking on three assists for good measure. Carter Hawthorne ’19 tallied a hat trick of his own, while regular contributors Niall Devaney ’16 and Quentin DellaFera ’16 each scored two goals. Ben Shively ’18 displayed a great show of hustle in the game, pacing both squads with six ground balls and two forced turnovers. Goaltender Ted Bergman ’17 once again recorded double digit saves in net, stopping 11 shots in just under 50 minutes of action. In the opening minutes of the game, Taylor Ghesquiere ’18 and Greg Pietroforte ’16 got the Cardinals on the board. Two quick goals by Oneonta would even the score briefly, but a 7-0 Wesleyan run to end the half would give the Redbirds a commanding 9-2 lead at the break. Stanton began the run just 28 seconds after Oneonta’s game-tying goal, before DellaFera set up Hawthorne in front of the net to double the Cardinal lead. Stanton, Hawthorne, and DellaFera all contributed goals to extend the Cardinals lead. Oneonta would commence the scoring in the second half, but three straight Cardinal goals stretched the lead to 13-4 by the end of the third, before adding two more to push their advantage to 11 early in the fourth. Oneonta scored twice in quick succession to trim the deficit to single digits, but Cole Turpin ’18 ensured the double digit victory for the Cardinals. Following the victory over Oneonta, the Cardinals enjoyed a week off from game action before traveling to Waterville, Maine this past Saturday to take on the Colby Mules. Led by DellaFera and Hawthorne, the outcome of the game was extremely similar, concluding in a commanding Cardinal victory. DellaFera totaled seven points, while Hawthorne had six to drop Colby’s record to 0-5 in the NESCAC. Trailing 4-3 after one quarter, Wesleyan outscored Colby 12-4 over the remaining three quarters to confirm a 15-8 Cardinal victory. DellaFera tallied an impressive four assists on the day, and also added a hat trick for icing on the cake. Hawthorne scored a game-high five goals, and added one assist, continuing what has been an impressive debut season thus far. Playmakers Ghesquiere and Stanton were their usual dazzling selves, each scoring a hat trick of their own. Devaney scored a goal and added two assists, while Christian Barker ’19 tallied two assists on the day. On defense, Quinn Mendelson ’17 was a disruptive force with his stick, causing six Colby turnovers on the day. In net, Bergman once again held his ground, stopping nine shots for the afternoon. Colby came out firing all cylinders, taking a two-goal lead just over two minutes into the game. A Ghesquiere goal would cut the deficit to one, but the Mules regained their two-goal lead a few minutes later. Goals by Stanton and DellaFera near the end of the first quarter evened the score, but Colby added one back before the end of the first frame. DellaFera and Stanton (twice) would score in the second period, while the Redbird defense held the Mules scoreless on their way to a 7-4 halftime lead. Colby opened the scoring in the second half before Hawthorne scored twice to stretch the Wesleyan lead to four. After a Colby goal to shrink the lead to 9-6, the teams quickly exchanged goals early in the fourth quarter. 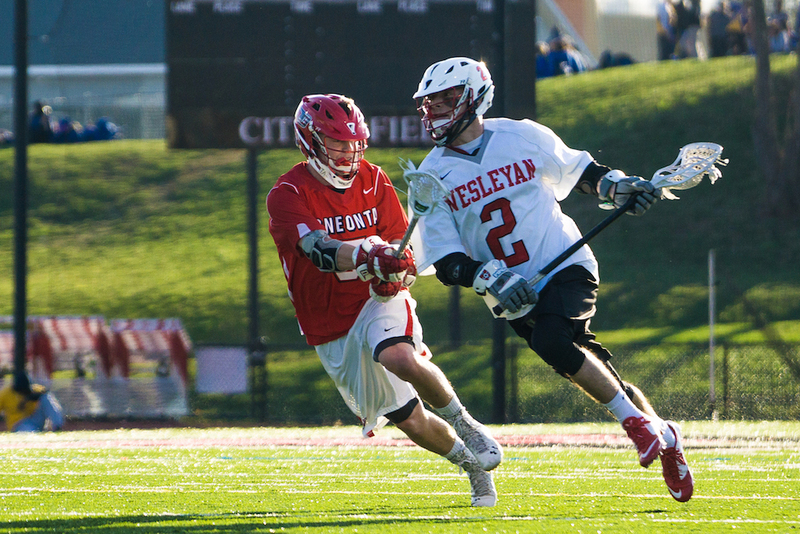 To extinguish any doubt, a run of five Cardinal goals in six minutes would seal the game for Wesleyan. DellaFera, who took last season off, has been encouraged by his team’s start to the season. The Cardinals return to game action on Wednesday when they host Little Three rival and No. 4 overall Amherst at 7 p.m. under the lights at Citrin Field. DellaFera also commented on how the team will prepare for this tilt, and what they must do to make a run in the NESCAC tournament. This article has been update to correct an incorrect quote attribution.